While public cloud services continue to grow – as this week’s Amazon Web Services and Microsoft Azure earnings reports illustrated – private cloud still enjoys a higher adoption rate. A recent survey, conducted by GigaOm and funded by Canonical, found that more than one-third of cloud users use private clouds, and more than half of those are OpenStack clouds. Hybrid cloud and multi-cloud adoption is on the rise, since it’s a strategy that offers the best of both worlds. The survey had about 3,000 respondents, including CIOs, managers, software developers, and engineers from a range of organizations in different industry verticals. The recent wave of price cuts by the cloud services giants has not had much effect on public cloud adoption, the researchers noted. The trends may also indicate that public cloud providers still haven’t addressed the security and compliance concerns enterprises have about the model. Nearly 65 percent of respondents agreed that OpenStack was now ready for mission critical workloads. The open source cloud architecture has matured substantially. There has been a huge push recently by large enterprise IT vendors either to support OpenStack or to make it an integral part of their products and services. Another reason for growing OpenStack confidence may be the fact that three key Linux distribution vendors (Canonical is one of them) launched new enterprise Linux releases that fully support OpenStack deployments, Dustin Kirkland, Ubuntu cloud solutions product manager at Canonical, said. 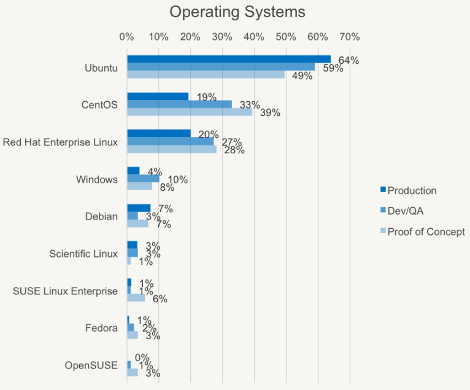 Ubuntu 14.04 LTS came out in April; Red Hat Enterprise Linux 7 came out in June; and CentOS-7 came out in July. It was unusual for all three major distros to release enterprise Linux versions in one year, making 2014 a big year for enterprise Linux, and consequently, OpenStack. Kirkland said lots of people will be deploying OpenStack clouds this year as a result. The next phase of growth in cloud adoption will be driven by the Internet of Things, growing amounts of data, and software defined data center technologies, in survey respondents’ opinion. Of the three, IoT will be the biggest driver. It is well suited primarily because of the flexibility it provides. The amount of connected devices is growing very quickly, so capacity to ingest and process data they generate on the backend needs to grow quickly as well. The devices also change quickly, which means the backend infrastructure needs to be able to adapt quickly. A company may release a new model of a personal activity tracker, for example, which may use a different protocol and have different capabilities than a legacy model. The vendor has to have infrastructure that can support both, Kirkland explained. Docker was of course last year’s hot new thing in IT. But the survey found that while interest in the open source Linux application container technology is high, few have actually implemented it in their data centers. More than 80 percent of respondents have not used Docker to deploy workloads.